Two quick pricks open up a whole world of accessories options. Huge gold hoops, delicate diamond studs, shoulder-brushing feathers: You'll eventually be able to rock them all, but maybe not immediately after getting pierced. Those tiny holes need quite a bit of healing before they're able to support heavy earrings. Weight's not the only concern for your first few pairs of earrings, though. Metal matters too. Mom's heirloom hoops will have to wait. Reputable piercers use sterilized studs and generally require that they provide the initial pair so they can verify that they're safe to use. Getting bacteria in the newly created holes can lead to infection, so using a completely sterilized pair of earrings is in your best interest. Depending on who's doing the piercing, a selection of pairs may be available. Ask if any pairs are made without nickel, which causes allergic reactions in many people. 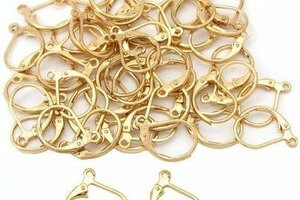 Surgical-grade stainless steel and yellow gold are good options and are generally free of nickel, at least in quantities that would cause a reaction. Keep in mind that you'll be wearing these earrings nonstop for several weeks. If you routinely wear necklaces and other jewelry, choose a pair of earrings that go with the rest of your collection. Piercers vary slightly in their suggestions for how long to leave in the first pair of earrings. For lobe piercings, some say they can come out in as little as three weeks, but the safest bet is to leave the pair in for a full six weeks – unless they become infected, of course. Cartilage piercings take longer to heal and should stay in for 12 weeks. Keeping ears and earrings clean is the major goal of piercing aftercare. Wash hands with soap before touching the earrings and avoid twisting them. The piercer may provide a solution for cleaning the earrings, or you can use a cotton swab dipped in very soapy water to gently clean the area. Use ice to soothe minor swelling, but call the doctor if there's redness, dramatic swelling or throbbing. An infection may require antibiotics, so it's not something to try to treat at home. If the piercer offers free follow-up visits, make one before removing the earrings. Once you get confirmation that the piercing has healed, it's time to look for a second pair. Again, be wary of metals that could contain nickel. 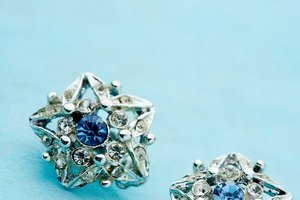 Even discount jewelers often sell nickel-free earrings. 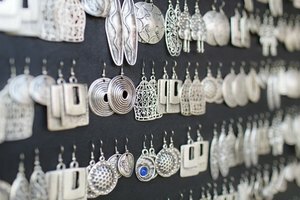 If earrings aren't labeled that way, look for pairs made of titanium, yellow gold, sterling silver or surgical-grade stainless steel. White gold is often made with nickel. After the piercing heals, avoid heavy earrings for at least six months. Stick to very small hoops (larger hoops can get caught on hair or clothing and tug on the ear), studs and small drops. If an occasion calls for large statement earrings, opt for plastic or thin filagree earrings. They're lightweight enough that they should do minimal damage to the healing ears.